Yesterday, an outfit calling itself the Satanic Temple rolled out a statue of Baphomet at the Arkansas State Capitol. They demanded Arkansas lawmakers erect the statue on capitol grounds or remove a Ten Commandments monument on those grounds. 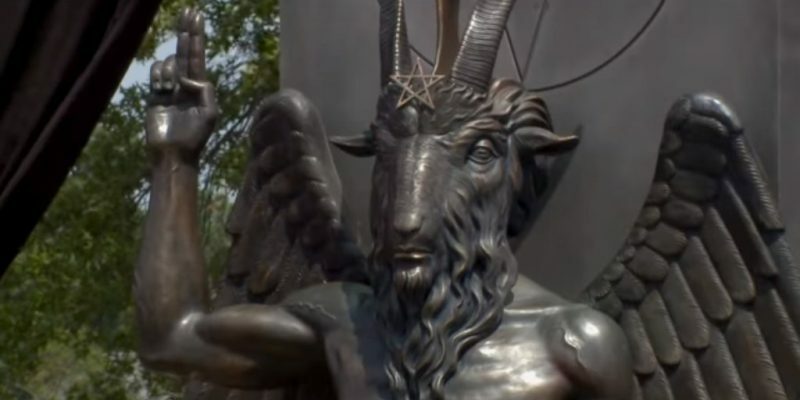 The Satanic Temple temporarily placed a bronze statue of a goat-headed, winged creature called Baphomet at the Arkansas State Capitol during a rally to call for the removal of a Ten Commandments monument already mounted on Capitol grounds. About 150 Satanists, atheists and Christians attended the First Amendment rally Thursday. The Satanic Temple says the Ten Commandments monument violates constitutional freedom of religion rights and that the installation of their 7 ½-foot-tall statue showing the 14th century idol seated and accompanied by smiling children would demonstrate religious tolerance. “If you’re going to have one religious monument up then it should be open to others, and if you don’t agree with that then let’s just not have any at all,” said Satanic Arkansas cofounder Ivy Forrester, a rally organizer. The statue of Baphomet can’t be installed under a 2017 state law that requires legislative sponsorship for consideration of any monument. The Satanist group removed the statue later Thursday. A little bit of background is necessary for this Ten Commandments monument. The monument was originally erected last year, but it was destroyed by an enraged opponent. The monument was rebuilt earlier this year. The ACLU and other opponents are currently suing the state of Arkansas over the monument. Is the monument legal? Your guess is as good as mine. I’m not an attorney, but after researching previous Ten Commandments display cases, it appears the legality of the display depends on the mood of the judge hearing the case. But there is no doubt that Christianity played a role in shaping the worldview of the American Founders. Anyone who is trying to claim that Judeo-Christian values did not have a role in shaping the American Founding is simply being dishonest. There is a good secular argument for allowing the Ten Commandments to be posted on public property as a celebration of American heritage. Now let’s get to the ludicrous trolls of the so-called Satanic Temple. For starters, they’re not really Satanists. Instead, they appear to be a more edgy bunch of Unitarians and humanists. They’re so lame that they’re erecting a statue of an idol that the King of France accused the Knights Templar of worshipping in the 14th Century. Was a statue of Lucifer not available? The “Satanic” Temple’s stunt is probably the best trolling so far in 2018, but in the end this is a silly stunt from a silly organization. They’re a soyboy’s take on what Satanism is. Just point and laugh at these morons. We’ll leave you with this Facebook post from our publisher, Scott McKay, on an alternative home for Baphomet.